How to Fast Rip and Stream DVD Movies to Roku on PC and Mac? Follow the guide to stream DVDs to Roku compatible formats for payback on TV with ease. I don't have a DVD player but I want to play DVD movie on my HD TV. Is there an app that can let me stream DVDs from my computer to Roku for later playback on TV? Roku is another popular streaming player, besides Apple TV and Chromecast. Compared with Apple TV and Chromecast, Roku has many advantages. It supports 1800+ streaming channels including YouTube, Netflix, HBO GO, Hulu plus, PBS, Pandora, etc. and 200,000+ movies and TV episodes. And it is accessible to search around top channels to find your specified content and check if there's free content available. And the Roku 3 even comes with remote with headphone jack for private listening. Despite of various merits, Roku doesn't know how to play DVD-like sources. Video formats supported by Roku only cover MKV (H.264), MP4 (H.264), MOV (H.264), WMV (VC-1, firmware 3.1 only). So, if you want to play DVD movies like Transformers 4 on HD TV via Roku, it is sensible to learn how to stream DVD to Roku with a professional and fast DVD ripper in the following part. How to Rip and Stream DVDs to Roku? 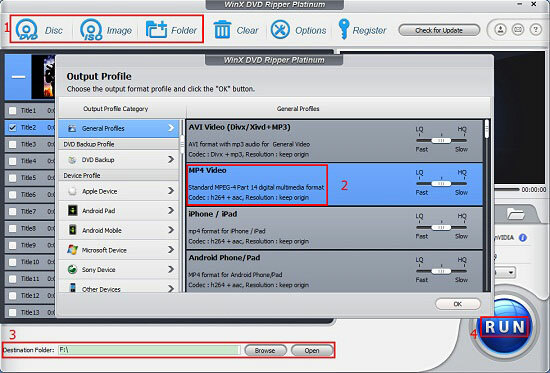 WinX DVD Ripper Platinum - No.1 DVD Ripper That Supports Any DVDs. Rip any copy protected DVD movies to Roku supported formats at ease. Disclaimer: Digiarty Software doesn't advocate ripping protected DVDs for commercial purpose & suggests referring to DVD copyright laws in your country before doing so. How to Stream DVD Movies to Roku on PC and Mac? *	Rip any DVDs to MP4, H.264, M4V, AVI, WMV, MOV, FLV, etc. *	Rip DVDs as high quality digital files quickly and stably. Step 1. Load DVD source. This DVD ripper allows you to rip DVD disc, ISO image file and VIDEO_TS folder for streaming to Roku. Step 2. Select output profile. After loading successfully, it will select main title for you automatically and popup output profile window for you. It is suggested to select MP4 (H.264) as your output, thus you can play it on TV via Roku, as well as play the ripped DVD movie on other devices. Step 3. Choose a folder to store the digital copy. Step 4. Hit RUN to start ripping DVD to Roku acceptable format. Thanks to the support for level-3 hardware acceleration, Multi-core CPU, Super Encode Engine based on MMX- SSE & 3DNow! and Hyper-threading technology, DVD ripping will be completed at super fast speed. Step 5. Stream DVD movies to Roku. -	Transfer the digital copy in MP4 to a USB file or SD card and attach it to Roku. -	Make sure Roku USB Media Player Channel has been installed from Roku Channel Store. -	Select the movie ripped from DVD to stream to HD TV via Roku. It may take several seconds to buffer or retrieve. The No.1 DVD ripping software which enables you to convert DVD to MP4, AVI, playing DVD content on Android/iOS/Windows phones and pads, chromecast, roku, PSP, Xbox, TV etc. DVD to NAS tutorial is prepared for you! We will lead you to rip DVD to (Synology/QNAP) NAS for backup, streaming or playing with Plex. Here you can download the best free Android video Converter for Windows and Mac to play any videos on Android Samsung Galaxy S/Note, HTC, Acer, Asus, Huawei, etc. This is a tutorial to stream DVD movies to new Google Chromecast 2. In this article, you will learn how to cast a DVD from PC/Mac to HDTV via Chromecast. How to Rip DVD to Media Server (Plex, NAS, Roku, DLNA etc. )?